Gather 200+ high school social studies students from across the state, add deliberation of various current high-profile foreign policy issues, combine with engaging and often passionate conversation with erudite guests who are experts in their policy fields* – and the results are an amazingly successful 18th Illinois Capitol Forum on America’s Future, which took place Thursday, April 12, 2018, at Illinois State University (ISU), Normal. Since the start of the school year, students from 17 Illinois high schools, with their teachers, have been researching, analyzing, and deliberating issues such as immigration, climate change, nuclear proliferation, terrorism, genocide and global economy, in preparation for the culminating activity, the Capitol Forum, when 10 to 14 student delegates, per school, are selected to represent their classmates in these deliberations at ISU, our collaborating partner since 2012. “The U.S. Role in a Changing World,” a publication of the Choices Program at Brown University, is the curricular basis for their preparation. Following the Forum, student delegates report to their peers on what they learned, observed and experienced, and complete an extensive evaluation which is used to improve future programs. Guest experts included: Lawrence Leck, Coordinator for the Center for Nonviolence, College of Lake County; Dr. Craig Mousin, Ombudsperson at DePaul University and founder/director of the Midwest Immigration Rights Center; Ben Silver, Community Lawyer, Citizen Advocacy Center; Dr. Clifford Singer, Director of the Program in Arms Control and Domestic and International Security, at the University of Illinois; Dr. Neil Vander Most, Visiting Academic Coordinator for the European Union Center at the University of Illinois; Dr. Julie Webber-Collins, Professor of Politics and Government at Illinois State University and an expert in school violence. At ISU, the coordinator is Dr. Richard Hughes, Professor of History and Education. Since the program’s inception in 2000, 296 Illinois high schools have participated in Capitol Forum. This year alone, approximately 1650 students in 72 different classes have used Choices materials and format in the course of this school year. 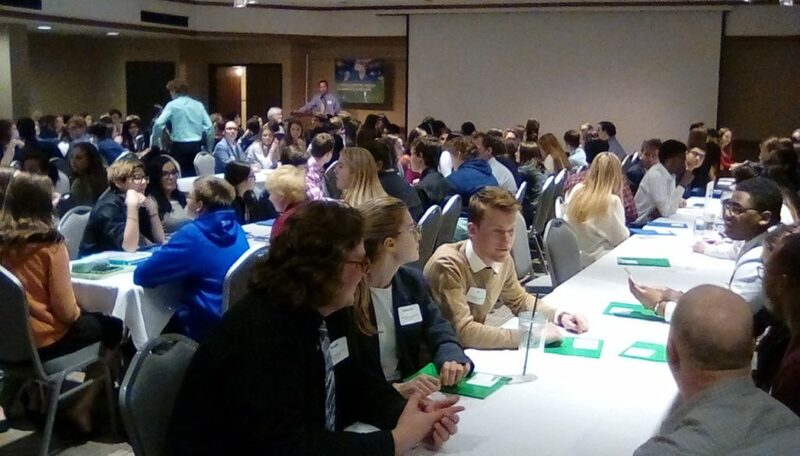 Since 2012, students enrolled in the History of Education classes at ISU (pre-student teachers) have participated in Capitol Forum as breakout facilitators. Several have gone on to involve their own students in the Forum. Twelve different congressional districts have been represented in school districts in the state. In 18 years, Capitol Forum has had two major partners, the Office of the Illinois Secretary of State (11 years), and Illinois State University (7 years). The McCormick Foundation has been a primary funder since 2006. The Choices Program, part of the Watson Institute at Brown University, has been a partner since 1999. An added feature during the April Forum was the presence of the League of Women Voters to register those who will be 18 years of age prior to November’s election. We plan to make this a regular feature of Capitol Forum.